How do vasectomies help wildlife? According to the latest UN predictions, human population will surpass 11 billion people by century’s end. As human population grows, wildlife everywhere is being pushed into oblivion. The Center fights the extinction crisis by protecting endangered species and promoting common-sense solutions like access to family planning and reproductive health services, as well as education, opportunity and equal rights for women and girls. Men are often left out of the conversation about the need for family planning services and how to address population growth — despite how crucial it is for them to participate in family planning. Well, not on our watch. And World Vasectomy Day is a great way to raise awareness of men’s birth control options. It was created to celebrate and honor the role they can play in slowing and even stopping rampant human population growth. Vasectomies are the most effective form of male contraception. For your partner and the planet, pledge to get whacked for wildlife. With more than 7.5 billion people on the planet and 227,000 more added every day, we're crowding wildlife off the planet. Vasectomies help. In honor of World Vasectomy Day, take the pledge to help wildlife worldwide by getting a vasectomy. Tell us about the wildlife you’re most passionate about protecting through preventing unplanned pregnancies and, once you get your vasectomy, inspire other men by sharing your story. Already have a vasectomy? Congratulations — you’ve taken responsibility for your reproductive future. Now take the next step to protect wildlife and show other men how getting whacked for wildlife changed your life for the better. Share your story and favorite endangered species with us and we might share it online. World Vasectomy Day was founded in 2013 by Jonathan Stack, an Emmy Award-winning and Academy Award-nominated filmmaker, and urologist Dr. Doug Stein. Their goal is to heighten awareness of, and dispel myths about, vasectomy, as well as increase access to the procedure and inspire more men to become engaged as equal partners with women in the family planning conversation. Since the inaugural World Vasectomy Day in 2014, more than 500 doctors in more than 30 countries have performed more than 4,000 vasectomies. 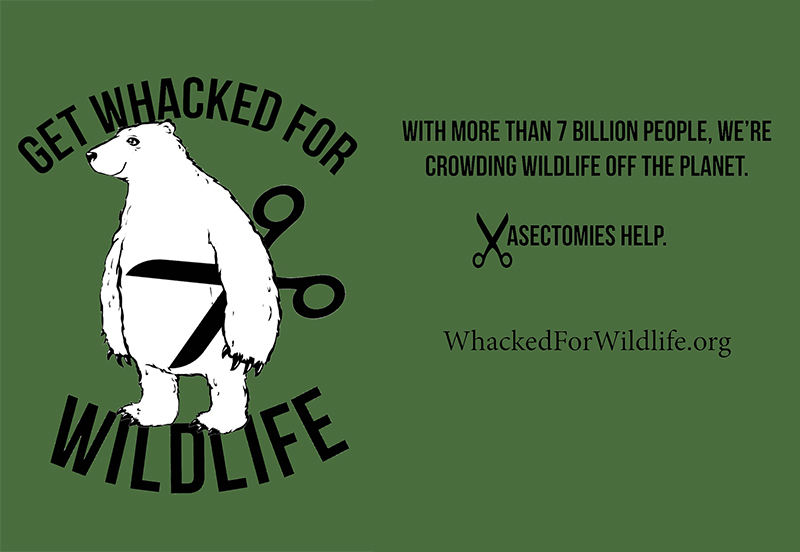 Join the World Vasectomy Day movement on social media by connecting with us @humpsmarter and @WorldVasDay and using the hashtags #WhackedForWildlife and #WVD2016. Learn more about the movement and find a vasectomist in your area by visiting the official World Vasectomy Day website. I knew when I was a kid, myself, that I did not ever want to have kids of my own, and I have also known since the age of 12 that overpopulation is behind virtually every environmental problem facing this planet. So at the mature age of 22 I had an opportunity to actually get a vasectomy — not an easy thing to do at age 22, I assure you — I jumped (or should I say I reclined) at the opportunity. For anyone of any age considering this step, let me tell you from the voice of experience: my decision at age 22 (I am now 56) to get a vasectomy was the single best decision I have ever made for myself, not to mention for my planet, in my life. Period. I have ZERO regrets, and heartily recommend the procedure for anyone seriously trying to reduce his ecological footprint on this planet. I've been concerned about unsustainable human population growth, overconsumption and human destruction of ecosystems for a long time. Though I knew at a young age I was ready to forego having children, I waited until I was 26, when I got a free vasectomy at Planned Parenthood. For me it's not just a personal decision, but also one small thing I can do as an industrial hominid to make our planet a better place to live for other species. There are too many people living out of harmony with their environment, and too few wolves, salmon and whipsnakes. It's turned out to be a good decision that I've never once regretted. Getting a vasectomy was so easy, I shopped at Trader Joes on the way home. It's one of the best decisions I've made for the environment and planet . . . but not worrying about an inadvertent pregnancy is a sweet benefit as well! The turning point for me was talking to a coworker. This was shortly after our second child was born. I was very concerned about our family impact to the planet mainly in terms of consumption of resources, pollution and just overall adding more population pressure to Earth’s ecosystems. My friend Mark told me that he’d had a vasectomy and had no issues with it. It was safe, effective and there was no pain involved. Mark said he thought a vasectomy after one, or at most two, children makes sense because at that rate you are only replacing yourself (and your partner) and this would lead to a stable, not growing, population — and that conversation made me strongly consider a vasectomy. As a young man I never felt a strong urge to have children, but now that I have them (and grandchildren) I see their intrinsic value and beauty. I try to teach them to be ethical in their relationships with nonhuman nature, but that ethical thinking is often eclipsed by the very nature of our technological society, where the burdens we place on natural systems are often hidden. Photo credits: Banner courtesy Stanzim/Flickr; shirt design by Russ McSpadden/Center for Biological Diversity.